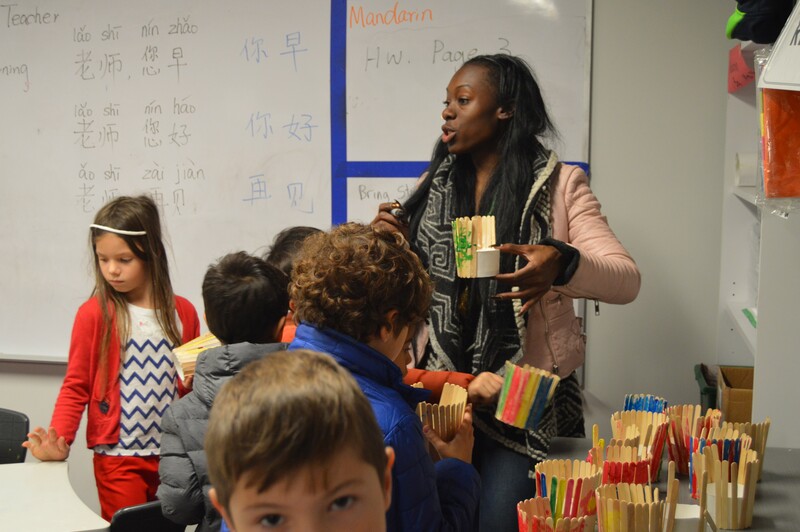 We wanted to take families through a day in the life of one Learning Expert Teacher named Ms. Weathers to understand more about how this model works and supports both our Subject Expert Teachers in focusing on curriculum and differentiated learning. 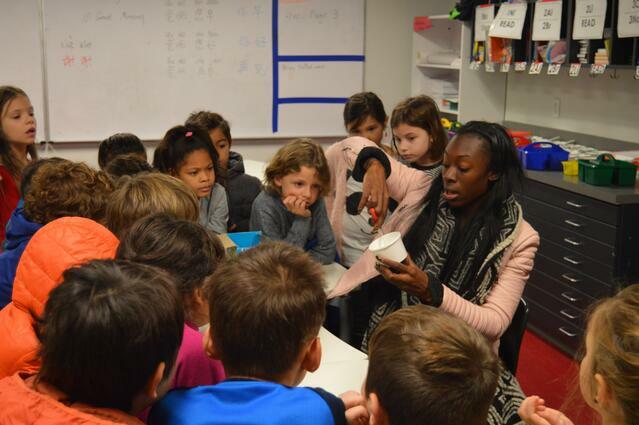 Below is an overview of Ms. Weathers' day with her students in grade 2 Lithium. "Not until you are in the role of an LET do you truly see the big difference and real need for the position," said Ms. Weathers. "We know the need for setting a high bar in the classroom, but there is also a real need to address that social emotional aspect—who a student is as a person and how to best deal with situations. 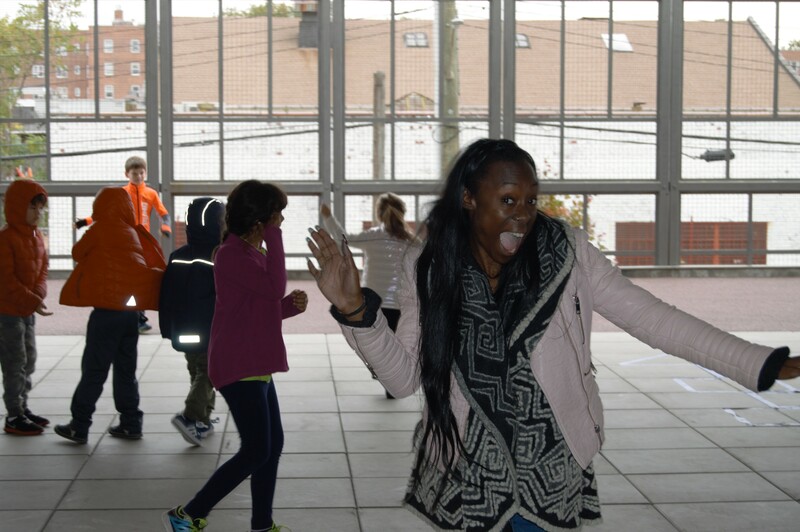 A large part of my role is to help teach kids how to handle their everyday emotions and everyday schedules. These are things that they will be dealing with for life." Ms. Weathers allowed us to tag along for a day to help our families understand all that goes on in a day in the life of one of our veteran Learning Expert Teachers. 7:55 a.m. We start the day at a morning meeting kickoff. “Let’s all gather round and listen to what our friends want to share,” Ms. Weathers told her grade 2 class at the start of school last Tuesday. Discussions followed about sisters and brothers, recent birthday celebrations, and even some creative storytelling. Ms. Weathers begins morning meeting while children get settled. We notice she anticipates who will sit next to whom, and she even makes suggestions for new seats on the rug for kids to be next to new friends. She is careful to redirect discussions and help students focus and respect who is talking. Ms. Weathers shares stories of her family with the students alongside their stories. “I think they deserve to know about me and my family if I’m asking them to share with our class,” she commented. 8:15 a.m. Once a week each Tuesday, Ms. Weathers leads a “Connections” class pulling together elements of several classes the children take. This week she announced the focus would be colonial jobs of basket weaving and tailor. Their humanities class with Ms. Goodin is reviewing Colonial U.S. History, and the craft work relates to their engineering and art classes at the moment. Ms. Weathers talks about sewing and certain students proudly offer up comments that their parents or grandparents enjoy sewing clothes. There is a general discussion of how sewing is a lost art, and many students discuss how they have taken sewing class or even learned how to sew with a grandparent. Ms. Weathers demonstrates for all the students how to construct the basket with a cup and Popsicle sticks. All the students jump in on the project. When finished, Ms. Weathers guides students in cleaning up before launching into a discussion and demonstration of needle work. She provides each student with colorful yarn and a large board to practice some basic needlework. 9:20 a.m. 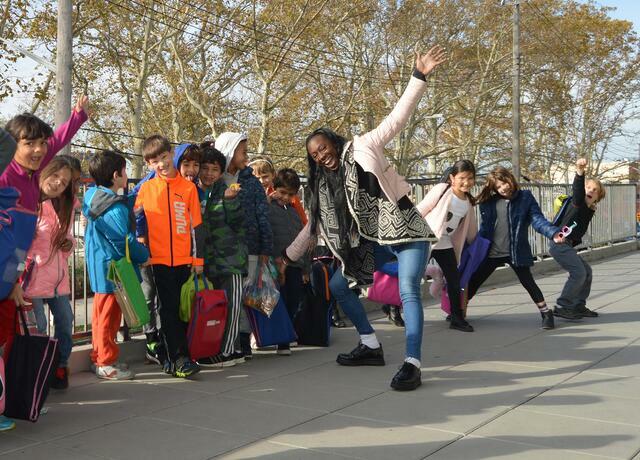 Connections comes to a close and Ms. Weathers asks students to put on their coats and proceeds to lead them outside to the Sigourney Playground where they meet up with Ms. Golka and Ms. Parekh’s grade 2 classes. During recess, Ms. Weathers spends time helping students resolve minor disputes, tying shoelaces, and listening to all sorts of stories from her students. She explained that by this time of the year she knows who will go read and who needs to run around, and she keeps a watchful eye on what all her kids are doing. 9:40 a.m. Ms. Weathers calls her class to line up. They respond quickly and follow her into the school again where they have a quick “hydration” break by the water fountains. Ms. Weathers reminds the kids how important it is to stay hydrated. 9:50 a.m. Ms. Goodin, a Humanities Subject Expert Teacher (SET) greets each student at the doors inviting them in to start reading. Ms. Weathers checks in with Ms. Goodin and they proceed to walk around the room checking CJs and meeting with students. Ms. Weather walks over to the bookcase to help students spending a lot of time choosing non-fiction books: “I see you are having a difficult time picking one book.” This launches into a discussion of what the student had been reading and what options exist that would be just right for them or more of a challenge. 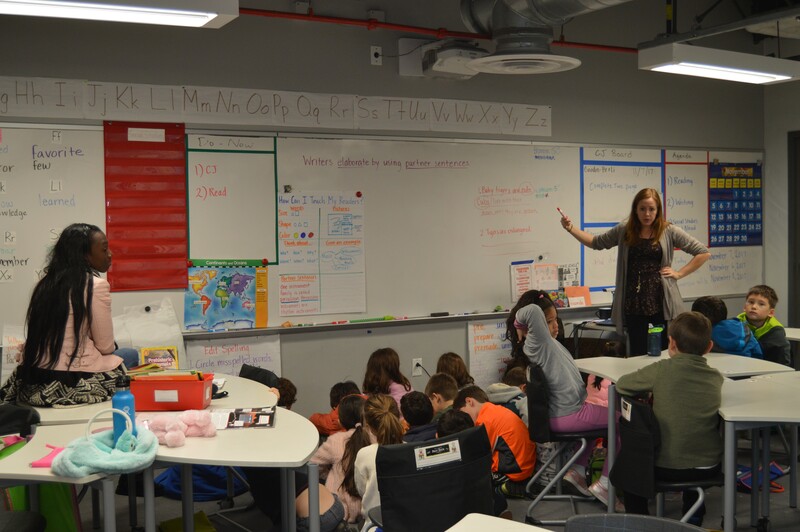 Because SETs receive students (and their LET) in their own classroom setting, SETs like Ms. Goodin are able to focus on readying the instructional environment and quickly transition to student learning when the class period begins. Unlike the “generalist” teacher common in many primary schools, where he or she is tasked with teaching science with as much exuberance and competence as grammar, the SET is solely responsible for teaching one discipline. For students, this means having teachers skilled enough in the discipline to create an enriched and advanced learning environment. 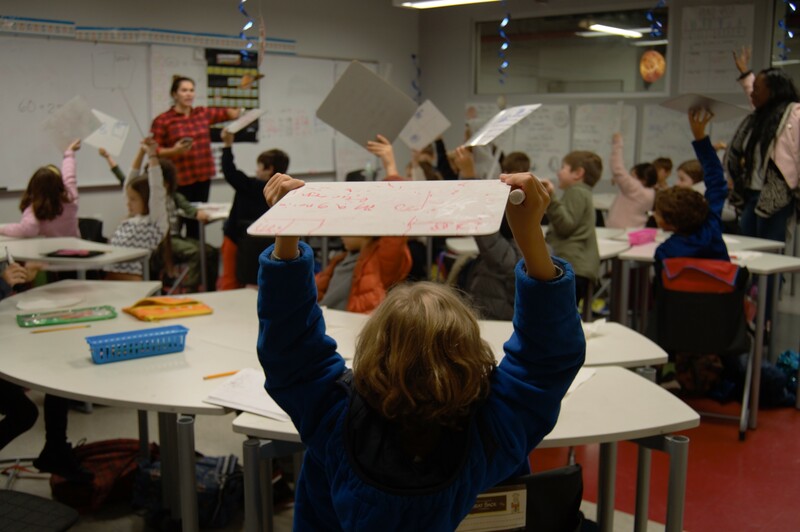 Additionally, it means that the SET is able to competently speak to their questions, unafraid of complicated answers, knowing that they have the support of the LET to check in on comprehension and address students’ varying learning styles. Midway through the class Ms. Goodin calls the class over to the rug for a discussion of reading inflection when reading out loud. 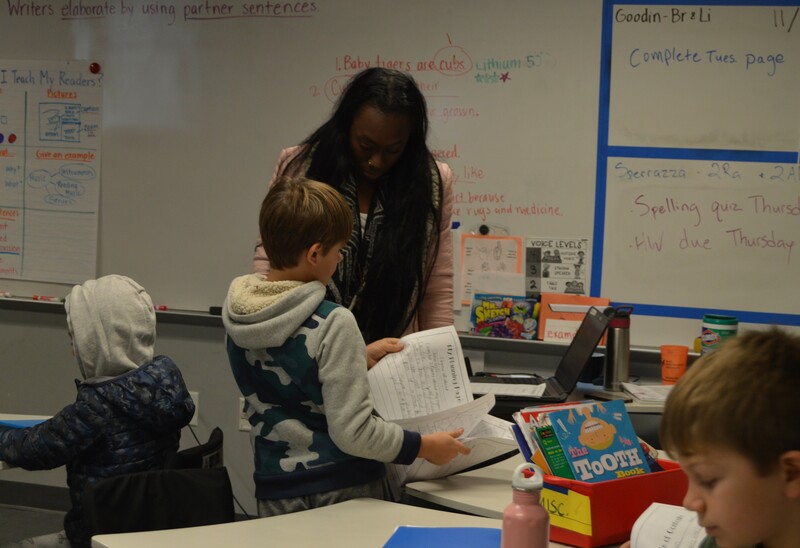 Ms. Weathers watches her students proudly and jumps in to help periodically when someone needs some extra attention, refocusing, or even encouragement. 11:15 a.m. At lunchtime Ms. Weathers escorts her students down to the cafeteria. She makes sure everything is set with the faculty monitoring lunch and then meets up with Ms. Golka and Ms. Ortega for a working lunch discussing lessons in math and science for the week. They spend time together addressing how to work on concepts with the students and plan projects together. 12:05 p.m. Ms. Weathers takes her students to READ where they continue individual reading as they had done the day before during this period. On Wednesday and Thursday, students will practice read aloud. 12:30 p.m. After READ, it's time for Mandarin. Ms. Weathers greets Ms. Zhang with her students, gets them settled in for songs, and then starts to prepares for her next class. Ms. Weathers oversees another recess on the terrace before walking her students up to Ms. Ortega’s math and science class. Another teacher assists with this recess period and Ms. Weathers is able to take a parent meeting that needed to be scheduled during the day. 2:25 p.m. In Math and Science class, students work as a group on problem solving in their heads. Whiteboards are used to help students track correct answers and soon small group work begins with Ms. Ortega and Ms. Weathers working with students directly. In between group work, Ms. Ortega gives the entire class problems and calls students to the board to show their work. Eager hands go into the air as soon as Ms. Ortega asked who wants to share the answer with the class. Later the class has a quick dance break to help switch gears to science. They move onto the rug, and Ms. Ortega reads the book What If You Had Animal Hair? that the kids loved and began discussions of what animals were favorites and why once the book came to a close. Previously students in 2 Lithium read What If You Had Animal Teeth? and created projects proudly on display outside Ms. Ortega’s room. During the discussion that follows the book, Ms. Weathers compliments them on their choices and reasons given to back them up. She also helps refocus some of the conversations in the group. 3:50 p.m. Ms. Weathers accompanies her class outside to meet the bus or parents at pick up. She is already planning and thinking ahead for the next day's class. 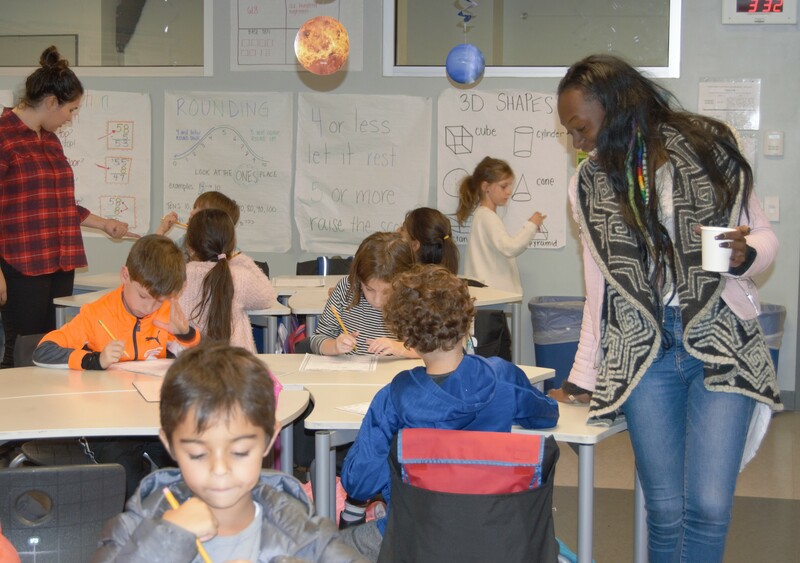 One day shadowing Ms. Weathers helped reinforce her unending commitment to know and understand her students, extensive collaboration with her fellow Subject Expert Teachers and Learning Expert Teachers in grade 2, and her constant supply of energy to engage her class. Many thanks to Ms. Weathers for allowing us to take a glimpse into her work and experience what makes her such an amazing teacher. She is one of our many faculty members truly making a difference in our students' lives every day.